Writing book reviews is a natural extension of the promotional work I do for authors and musicians through Scully Love Promo. As I work for a first time children’s author, and I have a seven year old niece and nephew (twins: Erika & Ethan) who I enjoy reading to, I have developed an interest in children’s books and have been reviewing quite a few of them. Camille Blue Amy, author of the delightful and beautifully illustrated (by the very talented Lorena Pugh) children’s picture book, Marshall and His Green High-tops, would like to show her appreciation to those of you who have taken the time to leave us a comment about the book on the Marshall Mouse Facebook fan page or on our MySpace profile and/or to those who have subscribed to our blog(s), by holding a little contest. There will actually be three draws: one on Facebook, MySpace and here at Scully Love Promo Reviews and the winners will receive an autographed copy of Marshall and His Green High-tops. 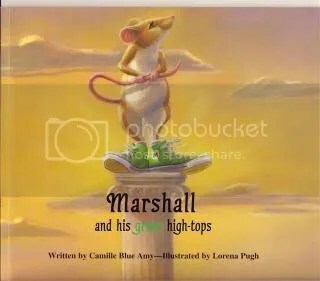 All you have to do (if you haven’t already) is subscribe to either the Marshall Mouse MySpace blog where you can read reviews of Marshall and His Green High-tops, or this blog and leave us a comment telling us why you’d like to have a copy of the book. Your names will be put in a box and the winners will be drawn fair and square. The draw will take place on Saturday, August 1st and we will contact the winners to get your mailing address so we can send you the book. Thanks so much for your support and don’t forget to tell your friends with small children (ages 2-6) or grandchildren about Marshall Mouse!